Treatment depends on the type and severity of the injury. Always see your doctor if pain persists after a couple of days. What you may think is a straightforward sprain may actually be a fractured bone. Chiropractic care may help to rehabilitate the injured site and, depending on the injury, include exercises to promote strength and flexibility. Returning to sport after injury depends on your doctor’s assessment. 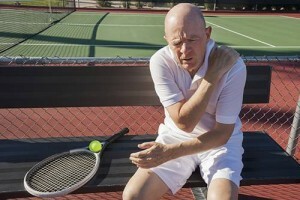 Trying to play before the injury is properly healed will only cause further damage and delay recovery. In the meantime, you can maintain your fitness by choosing forms of exercise that don’t involve your injury; for example, ride a stationary bicycle while your sprained wrist is healing.